Coastal Massachusetts is blustery enough that a robust offshore wind system could power a residential and commercial electricity load that is 20 times larger than exists today. That math, highlighted in an advocacy group’s recent report, has some clean energy backers questioning Republican Gov. Charlie Baker’s pursuit of Canadian hydropower to meet state renewable energy targets. The transmission lines needed to bring that hydropower to Massachusetts have faced strong opposition in neighboring states. Ben Hellerstein, state director of Environment America, which produced the report, says hydropower offers a “comfort factor” to an administration, leading legislators, utilities and big businesses more at ease with an incremental approach to weaning the state of fossil fuels. In 2016, Baker signed a bipartisan measure green-lighting the procurement of 9,450,000 MWh of clean energy annually. Clean energy advocates are elated that the law opened the way for bids on 1,600 MW of offshore wind. But they are disappointed that Baker opted for 100 percent hydropower to fulfill a separate call for 1,200 MW of clean energy. More local offshore wind, they say, would better mesh with Massachusetts’ ambitious goal to curb greenhouse gas emissions 25 percent below 1990 levels by 2020 and 80 percent by 2050. Connecting with hydropower generated by Hydro-Quebec requires construction of a lengthy, land-based transmission line. Last month, the New Hampshire Site Evaluation Committee rejected the Baker administration’s first choice, the 192-mile Northern Pass project proposed by Eversource Energy partly because it would have cut through the state’s iconic White Mountains. A second option, the New England Clean Energy Connect, is under permit review now. That 145-mile transmission line would run from the Canadian border to a Lewiston, Maine, substation. Central Maine Power, part of Avangrid, also partnered with Hydro-Quebec on this project. On the offshore wind front, Deepwater Wind, Vineyard Wind and Bay State Wind have submitted proposals to install the state’s first round of turbines in coastal waters. 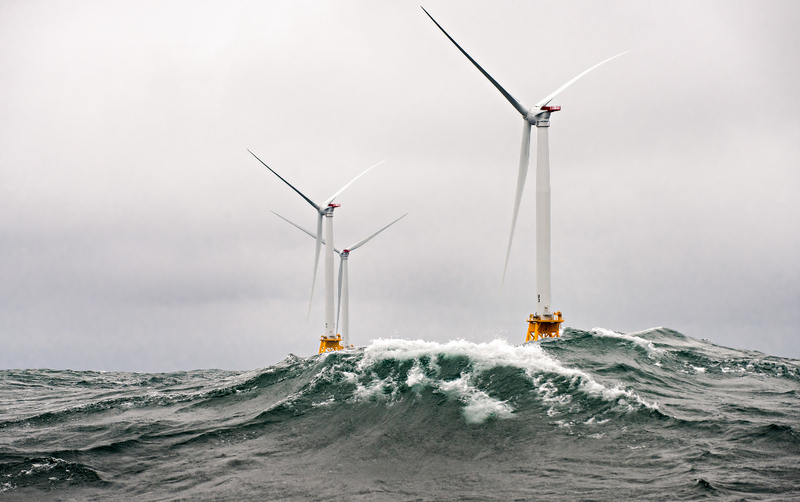 Gideon Weissman, a policy analyst with the Frontier Group, sees no reason why Massachusetts shouldn’t drop the hydropower option and fold those megawatts into more offshore wind projects. Frontier co-authored the report “Wind Power to Spare: The Enormous Energy Potential of Atlantic Offshore Wind” with Environment America in late March. They drew upon calculations from the U.S. Energy Information Administration, the National Renewable Energy Laboratory and the Interior Department’s Bureau of Ocean Energy Management. Massachusetts stood out in the study because of its combination of relatively shallow waters and high wind speeds. The overall cost of new offshore wind has fallen by 25 percent in the last five years, according to the asset management firm Lazard. And Bloomberg New Energy Finance predicts those costs will decline an additional 71 percent by 2040. That might be, but the state shows no signs of budging on hydropower—even when critics question methods used to account for quantifying the emissions of heat-trapping gases. Katie Gronendyke, a spokesperson with the Executive Office of Energy and Environmental Affairs, says a balanced approach is crucial to diversifying the state’s energy portfolio. “Large-scale renewable resources like hydropower can play a critical role … by delivering reliable, clean baseload generation to meet Massachusetts’ energy demands and greenhouse gas reduction targets,” she wrote in an email. Boston-based attorney Mark LeBel says the clean energy nonprofit Acadia Center, where he works, “strongly supports going big on offshore wind all across New England,” but recognizes that the appeal of hydropower is its low price. LeBel emphasizes that the more renewable sources Massachusetts can bring online, the less additional natural gas infrastructure it will need. Hellerstein and Weissman are aware that connecting offshore wind power to population centers on the mainland will likely cause disputes, but they say those shorter distances make more sense than transmission lines such as the Northern Pass. Earlier this year, the Federal Energy Regulatory Commission granted permission to a company called Anbaric Development Partners to advance the concept of an offshore transmission network capable of moving up to 2,400 MW of power. In the meantime, Democratic legislators continue to try to push Massachusetts farther on renewable energy. A bill released in February by the Senate Committee on Global Warming and Climate Change guides the state toward 100 percent locally generated renewable electricity by 2035, with other sectors such as heating and transportation following suit by 2050. That bill, called the Act to Promote a Clean Energy Future also would accelerate the timeline for the state to develop its first 1,600 MW of offshore wind power and also boost that total to 5,000 MW by 2035. In tandem, it sets an energy storage target of 1,766 MW by 2025. Hellerstein notes that solar power, long dismissed as a no-go in Massachusetts, flourished once legislation matched the technological advances and possibilities.